"Your winsome smile will be your sure protection" I hope my smile bring me "protection". Its funny that some of the staffs in a company used to call me 'the ghost who "never" smile'!!!. 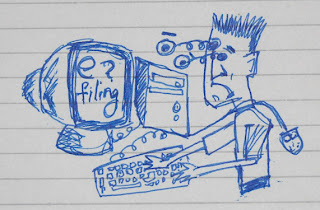 Anyway today is sunday in that holiday spirit i tried to doodle my present state and the result u may may have already seen... its e filing mania everywhere and am right in the middle, may god have mercy on me! !